Well even though the camera broke I was still able to get some good pictures of my kids on Christmas. Just a note - we are a hick family, so that will explain the fact that my sister's kids came to Christmas dressed in Camo! They are so funny up there in Potter County! My brother's kids are Paige and Matthew and my sister's kids (in the camo) are Hayes and Kamryn. They were all so good at Christmas - I was really impressed! I had so much fun watching them open their gifts! It is fun being an Aunt - you get to spoil the kids and then send them home! Well it was a great Christmas despite the broken camera - it was really fun and somewhat relaxing being home. Now back to my real relaxing by my fireplace, it is my night to do nothing! I love it - I am not even going to try to clean up! Well...it has come and past...the 6th Annual Holiday Open House! After cooking and preparing my house for over a week (which by the way - I just love cooking, the cleaning, I could do without!) the event took place and was a huge success. I had over 120 people come and enjoy the festivities. It was so fun to have so many people come and eat the food that I made. That does sound kinda weird, but I just love cooking for others and having people over. I guess maybe because my spiritual gift is hospitality. Anyway, I am glad that the freezing rain held off and people were able to come to the party! Now the downer - I have to clean up my house! The other downer, my little puppy Tucker had to go on a playdate during the party, I think he would have tried to sample some of the food and tried to get a little too friendly with the guests. So a big thanks to Miss Karen for babysitting Tucker. And since he missed the party and many people didn't get to see him - I thought that I would include a picture! So I must admit that I am a sucker for cute kids, but I am especially bias towards my nieces and nephews. My sister Jill sent me this picture the other day and I just loved it so I thought I would share it with all my friends. 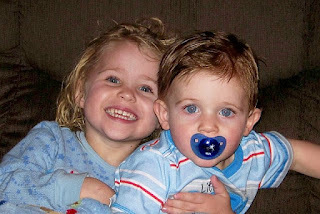 I am pretty sure they may be some of the cutest kids ever (maybe because they are related to me). Anyway - I think the blue clothing really brings out their beautiful blue eyes. It is hard to believe that Kamryn will be four in a just a couple months and Hayes is now 16 months. Wow - how they grow. I can't wait to see them along with my brother's kids (Paige and Matthew) at Christmas time. One reason I love having them around on Christmas is the excitement that they bring. I love my family but since it is just Dave and I with my mom and dad, Christmas morning can be a real dull time. Dave doesn't really talk or smile or get excited about Christmas, nor does my dad so my mom and I talk to each other and show each other what we got. But later in the day when the kids come, life gets fun at the Grant house. Four grandkids, five grant kids, three spouses, mom and dad, cats, dogs...let's just say it is crazy but fun! !